Former NFL quarterback Tim Tebow is getting married to former Miss Universe Demi Leigh Nel-Peters, who won the pageant in 2017. Tebow, 31, posted photos of himself on one knee and Nel-Peters, of South Africa, who appears to be wearing her engagement ring. The former Denver Broncos and New York Jets quarterback said, “Thank you for saying YES and making me the happiest man in the world. You’re the love of my life, and I can’t wait to spend the rest of my life with you. She said yes! Tim Tebow and Demi-Leigh Nel-Peters are engaged. The both reportedly shot the photos at Tebow’s family farm near Jacksonville, Florida, People magazine reported. “I’m so excited for the wedding, and I can’t wait to spend forever with Tim,” Nel-Peters, 23, told the magazine. The report added that the former quarterback flew in Nel-Peters’ family and friends from South Africa so they could be there for their engagement. Last December, the model told Fox News about the relationship. “It’s wonderful to be able to share my life experiences with somebody who’s so understanding and supportive,” Nel-Peters said. Tebow spent years looking for a relationship—despite being one of the most popular American sports figures at one point in his career. “I’m looking, but I just can’t seem to find anyone,” he told People magazine 2017. “I don’t want to be single; I’m ready to settle down and start a family. I want to have kids. I have so many things I want. No one will be happier than me when I finally find the right person. Tebow flamed out of the NFL in 2015 after a standout college career with the University of Florida, where he won two BCS National Championships. 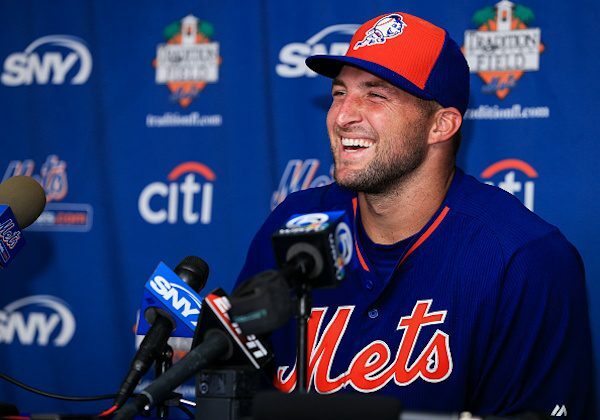 In 2016, he announced he would pursue a professional baseball career and signed a single-year contract with the New York Mets. He played Minor League Baseball in 2017 and 2018.